The Spring 2012 issue of the Baldwin Echoes — the alumnae magazine of The Baldwin School in Bryn Mawr, Pennsylvania — arrived in yesterday’s mail. More interesting to you, I’m sure, than the mission statement of my alma mater is the fact that one of my fellow Baldwin alums — Helen Runeyon Hills of the Class of ’46 — recently wrote a book called Still Riding at 80. Delusional? Not according to Helen, who is herself still riding at the age of 80. In her book, she presents profiles of 20 elder horsemen and horsewomen. She shares the physical, mental and emotional challenges faced by riders in their 60s, 70s and 80s, and gives guidance on how to adapt to the physical challenges that come with age, providing tips for comfort and safety. She encourages readers to ride as long as they want…and to quit with no regrets when the time comes. Thank you, Helen. 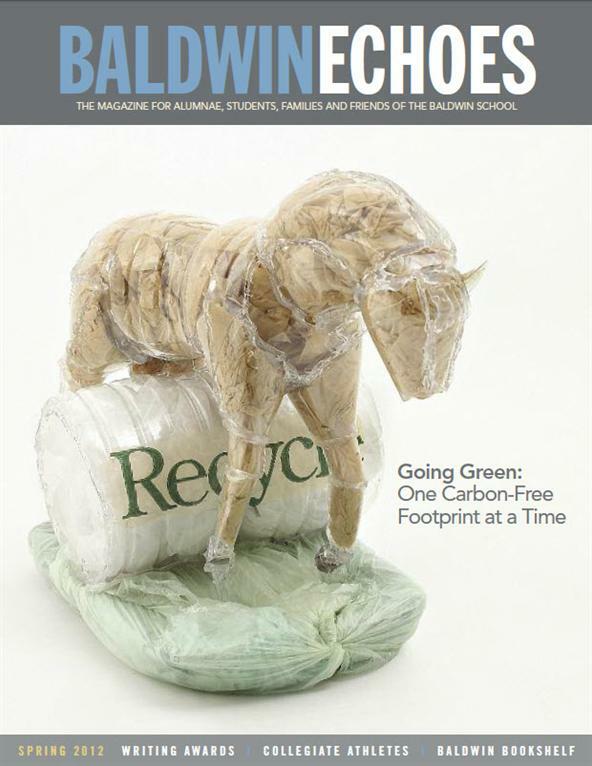 Also, on the cover of the latest issue of the Echoes is the cutest little plastic sculpture of a horse by Alexander Scannell, who is in the class of ’16. It was featured in the Montgomery County [PA] “Rethinking Plastic” Recycled Art Contest. Great choice of subject matter, Alexander. Good, so we’re ready for Helen’s next book.